The friendly staff at the Best Western Coastline Inn is ready to accommodate your every need whether you are traveling for business or pleasure. Take a walk along the historic riverfront discover an array of restaurants, shopping and entertainment. 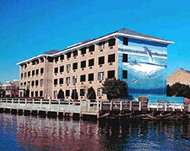 This hotel is just minutes away from the beach, golfing and the Historic District of Old Wilmington. The atmosphere of the riverfront hotel, coupled with a total commitment makes it stand apart from the rest. Best Western Coastline Hotel All of the guest rooms offer a panoramic view of the Cape Fear River, along with a deluxe continental breakfast, which is delivered to your door. The guest rooms are well equipped with numerous amenities, including cable television with HBO® and high-speed Internet access. Children aged 17 years and under stay free in the room with a paying adult.